Dolemite (Rudy Ray More) a famous hard hitting, dynamic, fehtclub owner and entertainer, gets framed by "Mr. Big", his henchman Willie Green (D'Urville Martin) and some crooked cops the F.B.I, agent Blakely (Jerry Jones) obtains Dolemite's release from prison on the condition that Dolemite will help the F.B.I, break up the racketeers who are terrorizing the city. Queen Bee (Lady Reed) has converted Dolemite's beautiful street girls into an army of Kung-Fu killers. The army is ready to assist Dolemite in fighting the hit men who are trying to fill a contract from "Mr.Big Kung-Fu fight ever filmed takes place. Dolemite literally rips the guts out of his arch enemy "Willie Green". 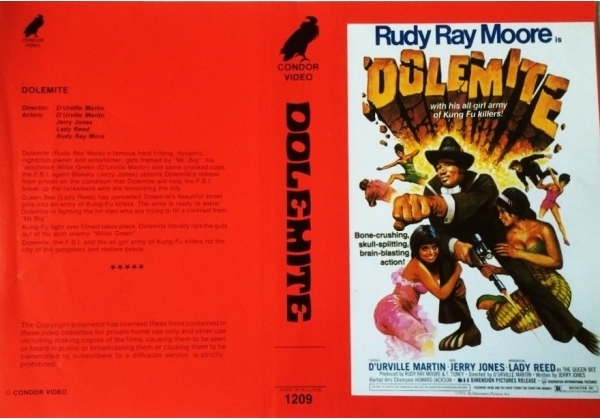 Dolemite. the F.B.I, and the all girl army of Kung-Fu killers rid the city of the gangsters and restore peace. Or find "Dolemite" on VHS and DVD / BluRay at Amazon.